This year's theme - The speed of change - was the subject of numerous interpretations. Designers from BAR Land Rover and Groupama Team France, both involved in the challenge for the America's Cup, highlighted how ESTECO technology has improved the speed of their high-performance catamarans. In the same vein, Cyan Racing described their optimization experience in the design of Touring Car tracks. 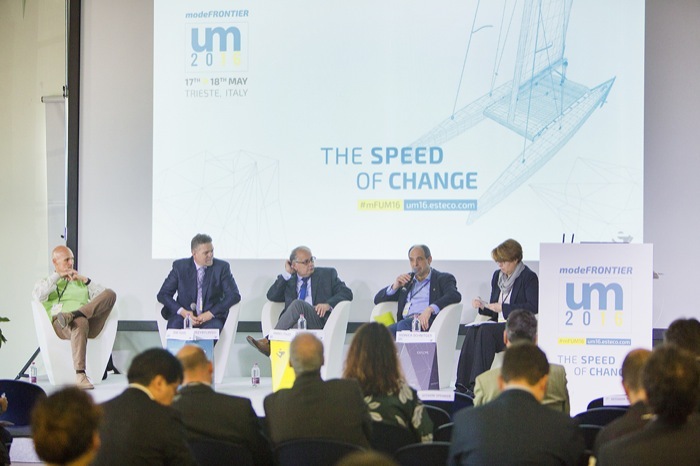 The conference highlighted how the race to innovate is not just isolated to the sphere of sport. Engineers in other industries face similar challenges and keeping apace with data and technology is not easy in today's world of rapidly changing product development. This year's roundtable, expertly moderated by Monica Schnitger, explored the role of multidisciplinary design optimization (MDO) in this context and identified the key barriers, in terms of model and data interoperability, that are slowing down its adoption across the board. Bob Tickel from Cummins, Carlo Leardi from Tetra Pak Packaging Solutions, Mario J. Felice from Ford and Stan Przybylinski from CIMdata brought interesting perspectives from their industries as well as insights on how to prepare technology and specialists for the paradigm shift. As demonstrated by the technology update during the conference, in this high-pace scenario ESTECO technology is one step ahead. Attendees were given a preview of modeFRONTIER 2016, which introduces a new modular, profile-based access to the innovative optimization environment. The update on SOMO showcased the application's integration with PLM repositories, ensuring quality and consistency throughout all stages of product development. Those attending the conference were able to take part in a 90-minute hands-on session and test the web-based collaborative optimization solution. In addition to all this, the R&D team gave a demo of the recently released beta version of the ESTECO BeePMN editor, showing how it manages CAE simulations and decision making processes in the same workflow. During the academic track, the new ESTECO Academy Design Competition 2016 was unveiled. Students from universities around the world will get the chance to test their engineering skills by taking up a "high-speed" challenge. Organized in partnership with Aprilia Racing and Gamma Technologies, the competition will see engineering students work to improve the performance of a four-stroke race engine by optimizing either the sub-components or the entire system. The conference wasn't all shop-talk and business. ESTECO showed its fun side by organizing a photo scavenger hunt at the end of day one. Teams of engineers were given maps and instructions, taking them on a tour of the city that led them to discovering interesting local spots and curiosities along the way. It proved a great opportunity to get to know other people, network and have a bit of fun before the social dinner. Read more about this (and much more) on Monica's Schnitger's blog!